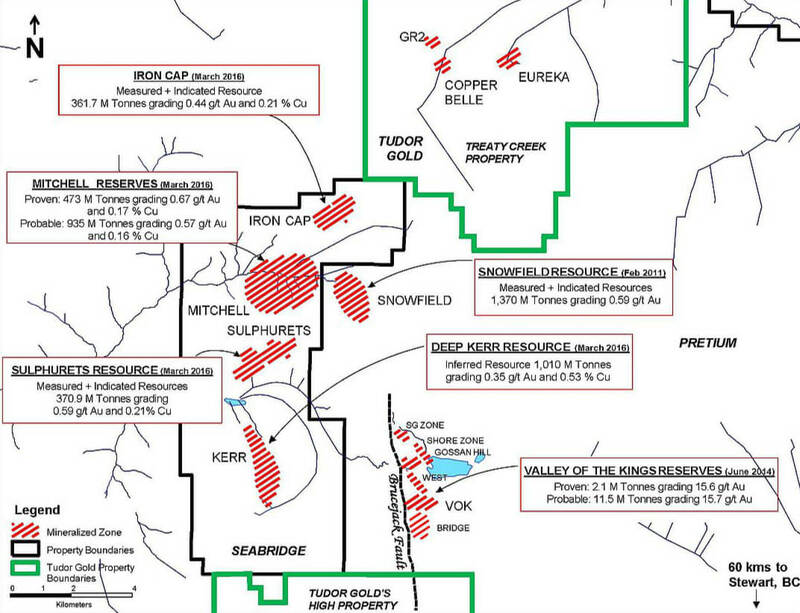 In June of 2016, TUDOR acquired a 60% interest in the Treaty Creek claims. American Creek Resources Ltd. (TSXV-AMK) and Teuton Resources Corp. (TSXV-TUO) each hold a 20% interest carried through to a production decision. The property is subject to 3% NSR royalties. Exploration of the Treaty Creek area over the past 30 years by various junior companies has resulted in the discovery of a number of surface mineral showings, some with very high gold and silver values. There have been over 150 diamond drill holes completed on the property from 1987 to date, in eight different mineral zones. 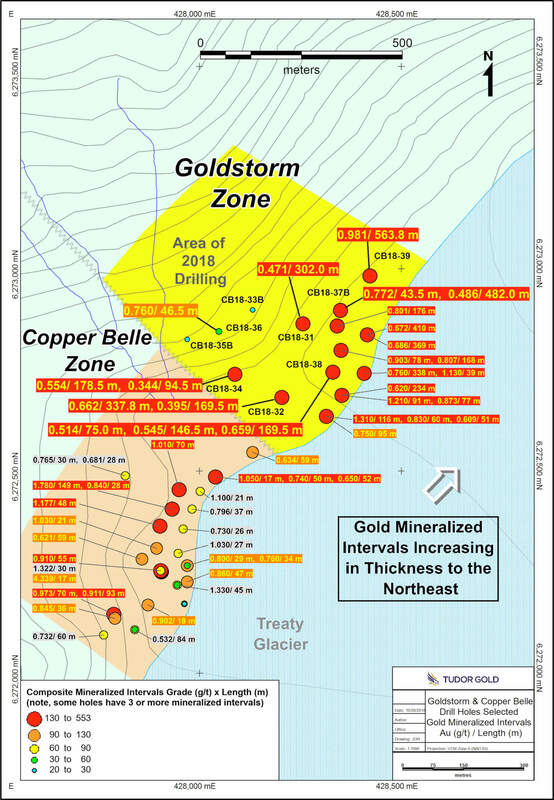 It has been only recently, however, that drilling revealed the potential for a large-scale, porphyry-style gold deposit at the Copper Belle and Goldstorm zones, located on-trend, and just 5 kilometers northeast of the KSM deposits. 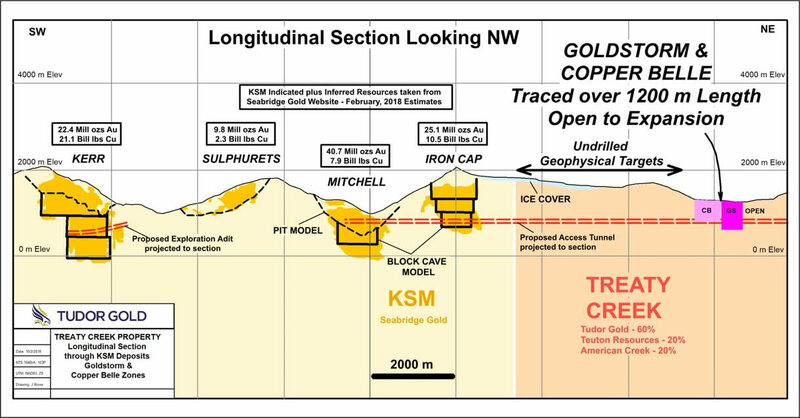 Copper Belle, and the larger Goldstorm, are hosted by the same belt of Jurassic-age volcanic and intrusive rocks that host the KSM mineralization and are also located close to the Sulphurets Thrust Fault, which continues along trend from the KSM property and is believed to be a controlling factor in the formation of the porphyry-style mineral bodies. There are no known resources or reserves on the Treaty Creek property and the presence of mineral deposits on properties adjacent to or in close proximity to the Treaty Creek property is not necessarily indicative of economic mineralization on the Treaty Creek property. All widths are downhole intervals as there has been inadequate drilling to determine true width. Length denotes drilled length – true widths of mineralization have not been determined. All widths are downhole intervals as there has been inadequate drilling to determine true width. MEG-conference presentation by Raul Sanabria.